The Newcastle Philatelic Society was formed almost 100 years ago during 1918. 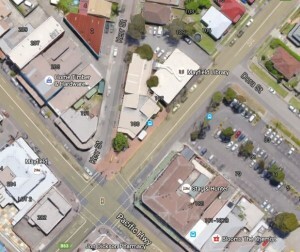 Geographic image of the street location of the Mayfield Seniors Hall. The monthly meeting place continues to be the Mayfield Senior Citizen’s Hall, 102 Hanbury St, Mayfield. It’s on the corner of Pacific Highway and Hanbury St; Parking is available behind Mayfield Library as well as in the large Council car park behind the Stag and Hunter Hotel. 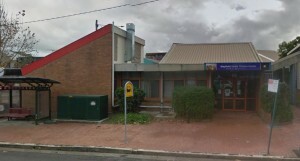 Image of entry to Hall below, and Google Aerial view of the location adjacent (click on image to enlarge). Members can submit up to 15 items (more by arrangement) for sale at a cost of $0.30 for each Lot. Vendors receive the full amount paid by a successful bidder.